Probably the only Hindu festival that falls on the stipulated date, that is January 14th , every year. This is the time when the Sun changes its course and comes into the northern hemisphere. This is known as the Uttarayan of the Sun in the sun sign of Capricorn or Makar. This day is celebrated in various ways all around the country. Just the names are different. It is known as Pongal in the south, when the people celebrate the harvest and make puddings out of the first paddy that is cut. In the north the previous day is celebrated as Lohri, when the people light huge bon – fires and sing and dance around it. All around India, sweets made of jaggery and various nuts made and eaten as they help the body fight the cold winter. People in the western part of the country fly kites on this day. The city of Ahemedabad in Gujarat holds a big Kite festival on this occasion for which people from various countries come and participate. 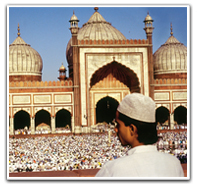 India was formed as a republic country on January 26th 1950. This day is celebrated as the Republic day and is a National Holiday. It is celebrated all over the country where the Governors of the state hoist the National Flag and take the honour of Guards. It is celebrated in an exuberant and grand scale in the Capital, Delhi. The President hoists the national flag and takes the guard of honour from all the three forces. There is a spectacular show of all the armed forces, with tableaus of various states and dances and songs performed on the Rajpath. The grand finale is performed by the spectacular show of the fighter planes. This beautiful ceremony is attended by dignitaries and commoners too and is telecasted live on television. People are honoured for their distinguished job on this day. The month of February brings along with the on setting of spring and crisp air. Other than the places near the Himalayas the whole country gets ready to welcome the spring. Practically, the best month to tour, the whole of India. This festival dedicated to Lord Shiva is celebrated all over India. There are many legends in the Indian mythology which gives the reason behind celebrating this festival. People not only pray the Lord on this day but also keep a fast and refrain from sleeping in the night. Especially the married ladies pray for a long life for their husbands. Legends say that Lord Shiva married Parvati on this day. Another story goes that it was this day when the Lord assumed a form of Lingam. Some say this was the day when he consumed the poison from the ocean, while others say that it was on this day that he asked Ganga to come down and purify the earth. Although the Muslim festivals follow their own calendar, the Bakri Id as it is popularly known is celebrated around February or March every year. It celebrates the sacrifice of Hazrat Ibrahim, who willingly agreed to kill his son at the behest of God. To celebrate the event, Muslims sacrifice one animal per family or group of families. There are prayers in mosques, feasting, and rejoicing. New clothes are worn and visits and greetings are exchanged. The month March brings in the spring season in the north when the days are pleasant and nights are cool, while it gives a hint of approaching summer in the south. It is supposed to be the last month in the Hindu calendar. Another Muslim festival that falls around March is the Muharram. It is not a festival to celebrate but a day is remembered and mourned as the martyr’s day of Imam Hussein. People take out big taziyas or processions on this day crying and mourning for Hussein. In some places people hit themselves and hurt themselves trying to remember the sufferings of Hussein. One of the biggest festivals celebrated all over India. 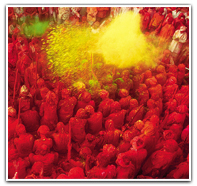 Holi is the last festival in the Hindu calendar and is celebrated by young and old, rich and poor and people from all the religions alike. It is the festival to welcome the spring and summer. People smear colours and splash water on each other and have fun. Sweets are prepared and people play with water and colours till late in the afternoon. Myriad colors of the blossoming flowers coupled with the tender green leaves, the melodious chirping of the birds, and an aura of romance and merriment marks the advent of the season of spring or Vasant. 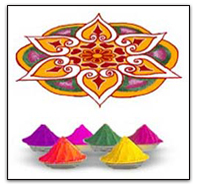 Holi enhances the romance of this season with its splurge of colors.